“Apple Security Warning” scam is a pop-up that purported to be a valid warning of Macintosh operating system. In reality, this is a fake web site that tries to deceive computer users. It issues fake warnings and alerts prompting visitors to call designated customer support number, a moneymaking technical phone support. Be aware that programs and services offered are not free. Bogus “Apple Security Warning” was created to scam computer users and steal money through fraudulent online transactions. When your browser is redirected to fake “Apple Security Warning”, or pop-up appears as you browse the Internet, it may mean that your computer is infected with malicious code. In contrary, your Mac system may be clean and the appearance of “Apple Security Warning” pop-ups was just caused by an infected web site you are viewing. Remember this site “Apple Security Warning” is malicious. Thus, you must avoid it to keep your computer safe and away from adware or malware threats. Browser Blocked for Security Reasons. Apple has detected that a virus has infected your system and trying to steal pictures, data, and social networking passwords. This is a serious hacking issue. Rectify it immediately as soon as possible. Tell this error code to the Customer Service Representative. Your Remote incoming connections are currently in open state. In order to prevent “Apple Security Warning” attack, you must take extra caution when visiting web sites particularly unknown ones. As much as possible, avoid downloading unfamiliar freeware or shareware that are commonly the carrier or adware and other malicious programs. To completely remove “Apple Security Warning” adware and stop the pop-up ads, you may have to scan your Mac computer with legitimate security tools and virus removers. Removing any relevant software also helps eliminate unwanted items on the computer. Below is a simple procedure to help you get rid of “Apple Security Warning” from Macintosh system. Procedures on this page are written in a manner that can be easily understand and execute by computer users. Before proceeding with the steps below, please close “Apple Security Warning” window if in case it is open. 3. Under Process Name column, look for Suspicious entries. Click the name to select the malicious process. 2. Run Malwarebytes Anti-malware for Mac. It will check for updates and download if most recent version is available. This is necessary in finding recent malware threats including “Apple Security Warning” pop-up. 5. After the scan, Malwarebytes Anti-malware for Mac will display a list of identified threats, “Apple Security Warning” is surely part of it. Be sure to select all items in the list. Then, click Remove button to clean the computer. In order to stop “Apple Security Warning” pop-up from Safari browser, you must reset the program. 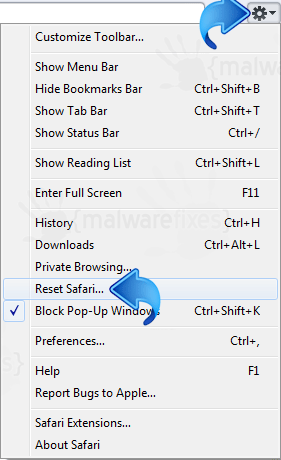 This will remove some settings and website data that are relevant to Adware or Malware. 1. Open Safari browser and go to Settings. 2. From the drop-down list, click on Reset Safari. 3. Select all necessary options as shown in the image below. 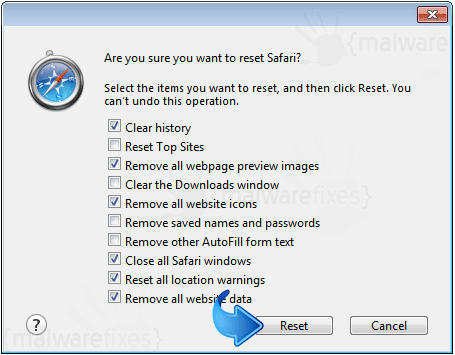 You may deselect others if needed but leave “Clear History” and “Remove All Website Data” checked. 4. Finally, click on Reset button to start the cleaning process. Restart Safari browser when done. “Apple Security Warning” pop-up should be gone after this procedure.